Hey, guys. I’m trying out a desktop client called w.bloggar to upload this article, and a couple images. This image is one of the first images I took with the little 3-megapixel camera I bought my wife. I’ve not used the camera much, but I was impressed with what it could do, despite the fact that it’s not an SLR. Someday, maybe, I’ll join those vaunted ranks. About this image: I am fond of taking pictures of “found” art or objects. I firmly believe that an artist can find beauty in the most mundane places and objects. So, this is a challenge I often pose to myself: without leaving this room or area, can I find something worthwhile to photograph and can I see it in such a way that I shed new light on it, reveal an unexpected perspective, or say something interesting about this place or object? I took a couple of pictures I liked that day, but I think this is the one I liked best. 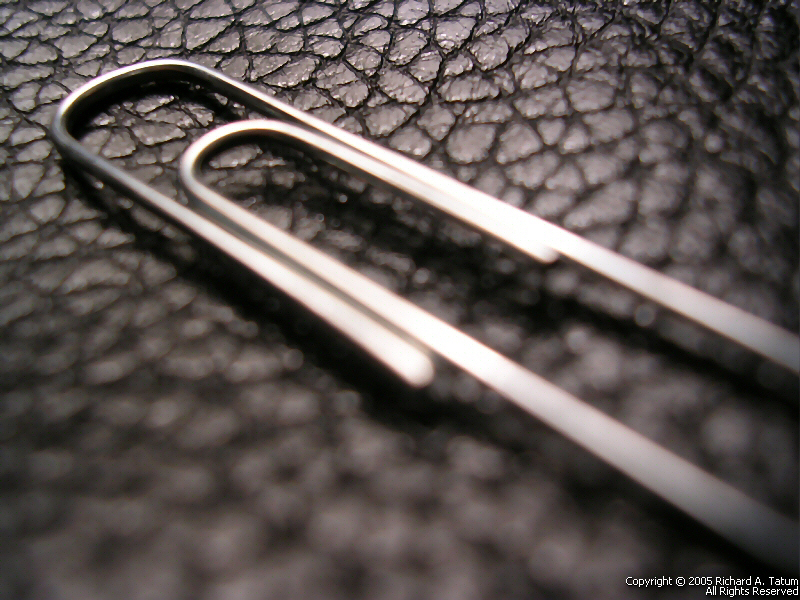 Obviously, it’s a simple paper clip. But there’s something about its specularity I really liked, and the leather texture it’s sitting on is a nice contrast. There are other contrasts I like, too: the extreme play of lights and darks, the extreme variance in the focal plane, the smoothness of the clip against the rough leather, and the sense of something plain and utilitarian on something like “rich” leather. There’s no statement here. And there’s no story. Just an appreciation of something I think is beautiful without a lot of artifice. But, certainly, I’d love to hear what you think, too.